Avie Records have released a new double CD set of Brahms�s complete sonatas for violin and viola. The soloist is the eminent prize-winning Russian-born violinist and conductor Shlomo Mintz who partners Lithuanian pianist Itamar Golan. Incidentally Avie operate their label for and on behalf of the musicians who retain ownership of their recordings. Brahms composed his First Violin Sonata at the summit of his creative maturity shortly after the completion of his First and Second symphonies and the heroic and virtuosic D major Violin Concerto. The Violin Sonata No. 1 was originally conceived as a sonatina for Brahms�s godson Felix Schumann, the last of Robert and Clara Schumann�s children. Felix was a talented violinist but unfortunately died at the age of twenty-five. The expansive three movement First Sonata is a gloriously lyrical work with long-breathed melodies. It is acknowledged as one of Brahms's most tightly structured and cogently argued works, with a degree of formal integration rare in his works. There are two reasons why the work is sometimes referred to as the �Rain� Sonata. Firstly Brahms quoted it in one of his own lieder, the �Regenlied� or �Rain Song�, Op. 59/3, a melancholy song in a minor key that recalls the long-lost days of youth. Secondly in the finale there is a running figure of sixteen notes for the piano that could be said to sound like gentle drops of rainfall. The Violin Sonata No. 1 is a tender and intimate idyll with a strong song-like aspect to the whole work. For me Mintz rather over-emphasises an atmosphere of melancholy and contemplation especially in first two movements. The opening movement vivace non troppo is played as slow as I have ever heard it although my ears eventually became accustomed to the pace. In the adagio the violinist�s measured approach seems to meander along and comes close to losing its way at times. I did however like the way Mintz picks out the plaintive motif and frames it so well. The playing in the finale comes across as fairly disciplined and well judged with characterful and forthright playing from Golan. The partnership bring the work to a lovely tranquil conclusion. While on vacation at Hofstetten, close to the Swiss holiday resort of Lake Thun during August 1886, Brahms found himself so refreshed and musically invigorated that he proclaimed the resort to be "so full of melodies that one has to be careful not to step on any." In fact during his time there Brahms composed most of three of his best loved chamber works in just a matter of days; the Second Cello Sonata Op.99, the �Thun� Violin sonata No. 2 and the great C minor Piano Trio Op. 101. The �Thun� Sonata is sometimes described as the �Prize Song� Sonata, as a result of the first movement�s main theme resembling a brief few notes from the �Prize Song� from Wagner�s Die Meistersinger von Nürnberg. The three movement sonata is both the shortest and the most immediately appealing of the three. Not for a single moment is the radiant, joyful mood ever put in real jeopardy and the melodies are of the long-spun, heart-warming variety that are particularly memorable and pleasing on the ear. 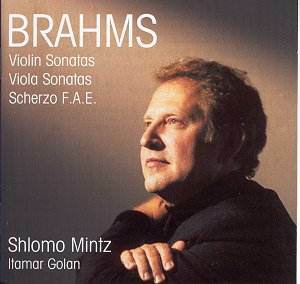 Violinist Shlomo Mintz displays some masterly playing and controls the idyllic nature of the score expertly without any sign of self-indulgence. In the compact and straightforward opening allegro amabile Mintz�s playing is polished and unsentimental with Golan�s impressive keyboard colour. The second movement andante tranquillo - vivace is a fusion of a slow movement and a scherzo and the performers offer appropriate tenderness with considerable poetry in their interpretation. I especially enjoyed the persuasive lyric quality to Mintz�s playing in the final rondo movement marked allegretto grazioso. Almost immediately after completing the Violin Sonata No. 2 Brahms composed a great deal of his Violin Sonata No. 3 in D minor during a vacation at Hofstetten in the summer of 1886. Brahms set the work aside for two years and completed the four movement score only when he returned to Lake Thun in 1888. The two violin sonatas are very different from one another; the Thun sonata is easygoing and radiates a warm lyricism from start to finish. In contrast the Violin Sonata No. 3 is a muscular, tough, and at times nervous work that offers more intense drama. Brahms usually reserved the key of D minor for his most deeply felt and passionate moods. Both Mintz and Golan are in fine form throughout the intense and darkly coloured atmosphere of the D minor score. The opening movement allegro dominated by a fiery main theme has an agitated and unsettled mood throughout that Shlomo Mintz performs with considerable emotional concentration. In the adagio a simple baroque nobility is combined with a deep romantic feeling to which the violin soloist is able to offer the appropriate meditative intensity. The short and sharply contrasted scherzo is an ingenious piece of workmanship, elegantly scored and flawlessly balanced but of a somewhat mysterious character. Clara Schumann described it as "like a lovely girl playing with her lover," while others have heard melancholy or even bitterness in the score. The playing of pianist Itamar Golan is particularly distinguished in the scherzo that flits past in a humorous but ghost-like fashion. The feverish mood of the opening movement returns to the hard driven and stormy finale in which the partnership of Mintz and Golan are impressive with concentrated playing that is never distracting. In an Indian summer of creativity near the end of his career, Brahms wrote the two Clarinet (Viola) Sonatas, Op. 120 (1894), the Trio for clarinet, cello and piano, Op. 114 (1891) and the Quintet for clarinet and strings, Op. 115 (1891). All the scores were especially composed for Richard Mühlfeld the popular virtuoso clarinettist whose playing had been an inspiration to the ageing Brahms. After completing the Third Sonata in 1888, Brahms returned to the duo sonata form just once more; in 1894. In quick succession, he composed the pair of sonatas for clarinet and piano that were published together the following year as Op. 120. The dedicatee of these two works was the clarinettist Mühlfeld whom Brahms much admired. The composer transcribed the scores for viola and piano and the versions are virtually identical. It is with these chamber works that Brahms bids a permanent farewell to chamber music. He was to write no further works in the genre. The Viola Sonata in F minor, Op. 120 No. 1 opens pessimistically but the spirit gathers strength and hope as the music progresses to end in triumph. In spite of certain reservations over the third and fourth movements, Mintz and Golan capture the main permeating elements of storminess and melancholy. In the opening movement one cannot help being impressed with their partnership for their expressive and characterful playing. The second movement is pensive with a unsettled rhapsodic feeling of introspection and searching. The viola playing is captivating, taken extremely slow but in a way that is most natural and unaffected. However, Mintz seems to perform with an excessively lugubrious approach in the light, graceful and restrained allegro grazioso where the mood alternates between grace and peasant-like earthiness. The closing movement vivace is intended to be particularly high-spirited. Mintz and Golan could have adopted a more vigorous approach to make a more determined journey to the score�s joyous conclusion. The Viola Sonata in E flat Major, Op. 120 No. 2 has an unusual structure and ends in a slow movement that bids farewell to chamber music. Throughout the score the lyricism of violist Mintz is consistently appealing and Golan�s piano playing is especially resilient. The opening allegro amabile has been called a masterpiece of seamless construction and has a gentle feminine quality that the duo reveal impressively. The central scherzo is brusque and impetuous. Mintz�s highly infectious playing is appropriately exuberant in an approach that brings out the passionate and unyielding nature of the movement with a fiery intensity. The slow concluding movement andante con moto takes the form of a theme and variations, in which, only one variation is in a quicker tempo. High-spirited, passionate and ebullient to the end Mintz�s wide range of expression, with phrasing never less than intelligent, is a highlight of the score. This Scherzo movement was written as part of the F.A.E. Sonata and is part of a collaborative work between Brahms, Robert Schumann and Albert Dietrich to celebrate the great Hungarian violinist Joseph Joachim�s visit to Düsseldorf; the home city of Schumann. The F.A.E. stands for frei aber einsam (free but alone) which was Joachim�s motto. He was given the test of guessing which composer wrote which movement. Schumann wrote the second and fourth movements, and Dietrich the first. Brahms's contribution is rhythmically exciting and original in conception, and it is still part of the violin repertoire. Only last year at the Bridgewater Hall in Manchester I heard the great Maxim Vengerov play the Scherzo movement as the opening work in a Brahms recital where he played all three violin sonatas. In this exciting Avie recording there is a clear meeting of minds with the splendid partnership of Mintz and Golan in an exciting and committed performance. All of these interpretations have a natural flow and flexibility and sound spontaneous. The sweet string tone of Mintz is impressive and Golan is sharp and taut in the frequently rich-textured piano writing. The partnership have cultivated a fine rapport and complement each other splendidly. Their involvement with the music is particularly striking, and they have exceedingly distinctive ideas about how every movement, every section, should be interpreted. There is considerable competition in the violin sonatas. This Avie recording would not be my first choice although it is very fine in its own right. In the violin sonatas I can highly recommend the masterly and greatly admired accounts by Josef Suk (violin) and Julius Katchen (piano) on Decca 421 092-2. Alternatively the far lesser known but equally impressive interpretations by Nils-Erik Sparf (violin) and Elisabeth Westenholz (piano) on BIS-CD-212 have delighted its group of admirers. For those wanting alternatives to all the works presented on this Avie release my suggestion would be the sweet and romantic accounts from the dream-team partnership of Pinchas Zukerman (violin and viola) and Daniel Barenboim (piano) available on the Deutsche Grammophon double set DG 289 453 121-2. An enjoyable and well recorded release that many will consider worthy of inclusion in their Brahms collection.